In the final installment of its “All the Forgotten Things” arc, Backways answers the question of whether newly-discovered whisperer (someone who can talk to the dead) Anna will rescue her girlfriend Sylvia from the grasp of the Outsider. Anna, alongside unlikely ally Coyote Bones, must face down those attempting to kill her, because if she dies, Sylvia will be lost. Unfortunately, her talent as a whisperer is exactly what the Outsider is after, leaving her walking the thinnest of lines between success and the end of the world. Then again, maybe that’s just me being a naive optimist. I probably shouldn’t be. People are terrible communicators, particularly in moments of stress. It’s equally likely these conversations would backfire horribly if all parties managed to get together. Worse, when one side holds all the information but the other side holds all the power, miscommunication can spark violence. That’s exactly the scenario writer Justin Jordan sets up. Two mysterious figures join forces: Wendy, who faced down the Outsider in the ’80s, sacrificing her sanity to contain it, and Dr Jacob Bruenner, whom Wendy sent to find out whether Anna is going to be the problem or the solution. They track down Coyote Bones and Anna, expounding on the history of the Outsider. 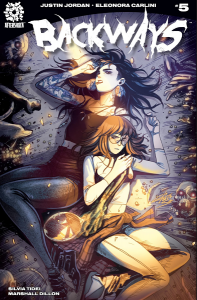 Unfortunately, because others interfered by sending an assassin after Anna, and because Anna is unwilling to accept any solution that leaves Sylvia behind, they fail to reach a compromise, setting up the confrontation at the heart of Backways #5. The Mourning Wolf, throwing a monkey wrench in Wendy and Jake’s plans. Jordan spends a great deal of the arc laying out his worldbuilding. It’s refreshing to get such a thorough look into a new setting. Unfortunately, it feels as though that worldbuilding comes at the expense of Anna as a character. 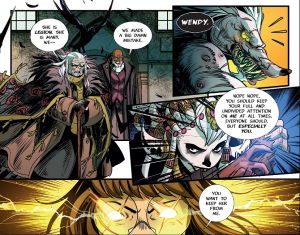 By the end of the arc, readers know she loves Sylvia, she’s incredibly stubborn, she assimilates new information about the world remarkably rapidly, and she somehow is an amazingly powerful whisperer. Where those abilities come from, what gives her the willingness to accept new and utterly absurd events as reality, who she is underneath all that goes unexplored. Anna exists as what she does and what she can do rather than who she is. Eleonora Carlini’s artwork, which marries the magical and the mundane, combined with Silvia Tildei’s pulsating colors and Marshall Dillon’s letters, bring Backways to life. 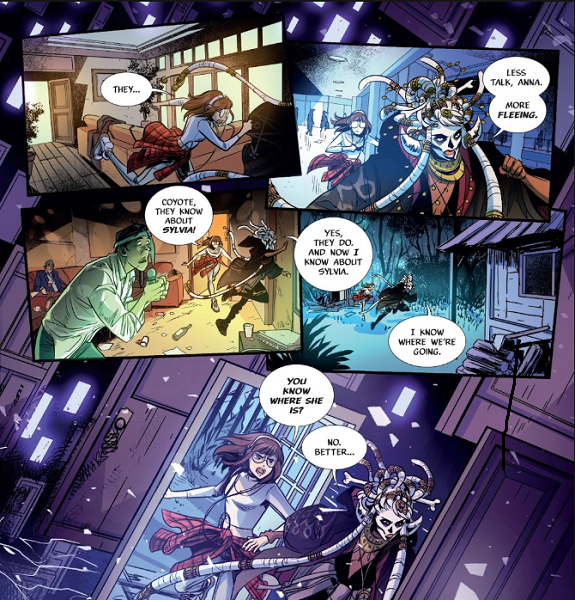 Carlini jumps Anna and Coyote Bones from setting to setting in small, fast-paced panels, perfectly communicating how the Backways themselves interweave with the ordinary world. Tildei infuses each page with brightness, playing up the contrast of shadows and neon lights. Coyote Bones battles the Mourning Wolf bathed in bright yellow, while Anna struggles with the dead in shades of gray underlit in blue. The contrasted colors allow the reader to follow the story’s flow smoothly through illustrated chaos. Visually, their work pleases the eye. The Backways create paths through the spaces between places, allowing Anna and Coyote Bones to jump from spot to spot as they travel. As with any good arc-ender, Backways #5 raises new questions while it answers old ones. However, few of the old questions it answers are those I had hoped to find. I adore complex worldbuilding, but I enjoy character development more. Characters drive stories. That leaves me wondering just what is driving Backways.